Late last year my good friend Jack Herbert released a game called Band Boss on the iPhone – so I thought I would ask him a few questions about its creation and his thoughts behind the game. Jack – congrats on the game. For those who don’t know about it could you summarize the game in a couple of sentences? 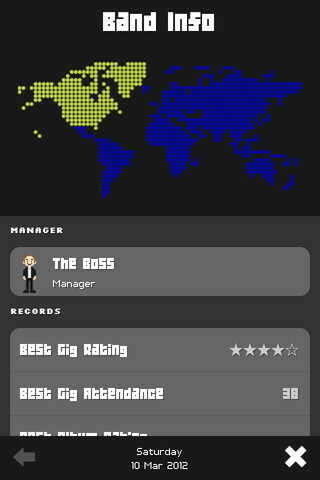 Band Boss puts you in control of a band or solo musician just entering the music industry. You take them on tour to build up word-of-mouth and raise cash, which you then blow on recording singles and albums. Along the way, you have to keep them happy, healthy, and make sure they don’t kill each other or anyone else! And what inspired you to build the game? There was a great shareware game back in the day called Chart Wars, by a student called Rob Cooper. He’s now building an impressive career in the games industry (working for Sports Interactive on the Football Manager series now, I think), and doesn’t have time to update or expand it any more. I’d always had my own ideas to expand that music simulation concept, and decided to bring something more casual and quirky to iOS. One of the things I thought was a really cool idea was how you used real world bands and crowd sourced some of the content. What inspired you to do this? Do you have any plans to do anything similar in the future? We just thought it’d be cool! When I started discussing early ideas for the game with its composer Mark Delany (www.racketbox.co.uk), we decided to use the game to promote exciting independent music from all over the world. An added bonus is that the bands have helped promote the game to their fans on social networks, so we’ve probably reached an audience we wouldn’t have otherwise. Do you have any thoughts on where things can go from here? Any new features/ updates planned? Loads of ideas: that’s the problem! We’ve got pages and pages of cool stuff we want to implement, and our Facebook page is loaded with really good user ideas too. The trouble is finding the time to make them happen. I’m more of a designer than a programmer (I had to learn Objective-C, Cocoa and Xcode from scratch to build Band Boss), so things take me a little longer than most developers. Once we released a reasonably stable version, I took a deep breath and focused on my day job again, so things have been pretty quiet. A big update is definitely coming in the autumn though. Our priority is to make the player feel more in control: like the world is less random and their decisions really matter. They’ll be able to hire extra staff to keep the band out of trouble (lawyer, bodyguard, etc), and there’ll be a lot more events that the player has to respond to. We also want to get some other fun features like music festivals and award ceremonies in there pretty soon. When you’re not building Band Boss – what sort of games do you enjoy? I waste a lot of time playing simulation games on the PC (Civilization, Football Manager, Tropico) or iPhone (Kairosoft). Games like that aren’t very fashionable any more, but there’s something about an immersive, carefully-created little world you’re in control of that’s really compelling. I get less and less time for console gaming these days, but on the rare occasions I get the front room to myself I mostly play big, open-world RPGs like Fallout, Elder Scrolls and LA Noire. Again, it’s all about immersion, and I love games that you can explore without (unrealistic) constraints. Dark Souls is next up, after I finally finish Skyrim (assuming I can focus on the main quest and resist pointlessly pottering around at the alchemy table, that is). What’s next for you – any more games planned? I’d love to make some more unusual little sim games in the future. Perhaps I’ll have time and resources to make whatever I want after Band Boss really takes off and the millions start rolling in. That’s what happens when you release iPhone apps, right? 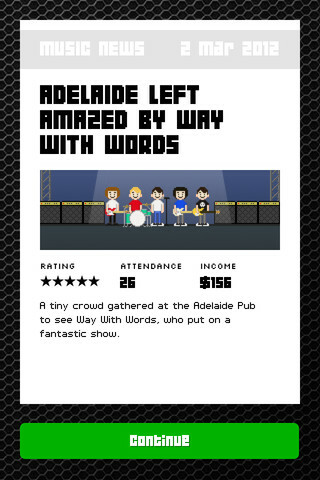 If you like the sound of Band Boss then you can buy it now for iPhone and iPod Touch, jogos do friv. Next Post Lost Winds for iPhone and iPad is currently Free!